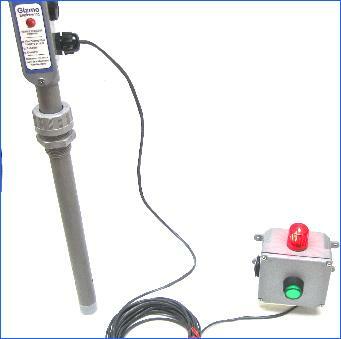 TANK LEVEL ALARM responds to high or low liquid level with a bright flashing LED and a loud buzzer. Always on duty because it uses uninterruptible battery power. Battery lasts for years. Low battery alert is built in. Different behaviors built-in. Tank-filling mode, snooze alarm. 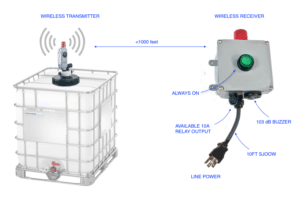 THE TANK LEVEL ALARM prevents overfilling of liquids by sounding an alarm when liquid level changes the position of the float switch. Very easy to install – just screw the tank-mount into the tank fitting. Battery powered units need no wiring, no electricians. Uninterruptible battery power works through power failures, can’t come unplugged, or be defeated. And because the Tank Alarms don’t use any power until alarming, the batteries last for years. Discussion about batteries Nevertheless, we offer wired solutions when needed. Easy to adjust the depth of the Tank Level Alarms – just loosen the compression fitting by hand and slide the level alarm to the correct depth. Adapters for any mounting situation. (2″ NPT, bolt-on flange, bulkhead feedthrough etc. 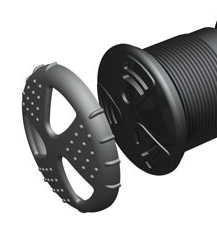 Float switch is protected inside a pipe. This protection of the level float is unique feature of Gizmo Engineering level alarms. Screw-on float guard allows inspection of the float. For liquids with solids, debris, we offer an optional screened-in float guard. Weatherproof enclosure – PVC enclosure is rated IP65. 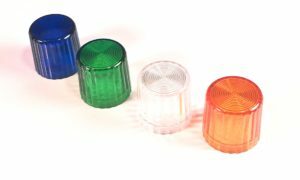 (NEMA4X) High-visibility beacon LED is clearly visible outdoors. Buzzer is very loud – like a smoke alarm. Push button to test the battery or to silence the alarm is included. Different modes are field settable. The snooze alarm feature can be disabled. Any Depth. Standard level alarm are available in 10″ increments. Up to 50″ is in stock. TH-PP-10 has a working depth of 10 inches for example. Depths referred to are working depths which means the distance that the alarm extends into the tank not counting the electronics enclosure. Custom depths have been made 20 feet deep. Includes a threaded reducing bushing to adapt the 1″ NPT compression fitting threads to 2″ NPT. If you are mounting through a hole, ask for a PVC retaining nut (1″ NPT) We have mounted these on just about any tank or vessel imaginable. See other mounting options section below. If you don’t see what you need, please call! Units come complete: Lithium battery is included as well as a 2 inch NPT reducing bushing. If you need another type of mounting, please choose from the options below. 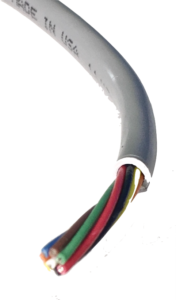 Polypropylene pipe and PTFE float switch are resistant to most chemicals at room temperature. Click here for chemical resistance chart. For more chemicals click here for a chemical resistance chart. Here is a breakdown of a typical part number T-PP-10. A button box connected by 10ft of cable so slience/testing can be done at ground level for applications where the tank alarm is on the top of a high tank. For products that us a cable, this connector makes it easy to disconnect. Also easy to snake through tight places when installing. A bracket designed for mounting on open top tanks and containers.